A huge library of electronic sounds created from quality orchestral samples. It'll take you days just to audition everything! Massive library. Wide range of sounds. Quality samples. Kontakt engine is a little fiddly. 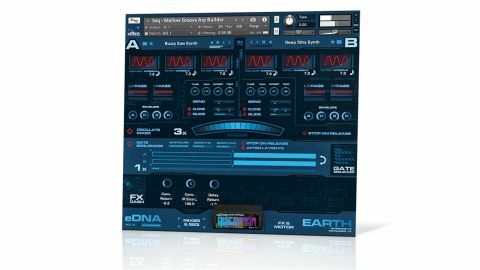 Drawing on - and mangling beyond all recognition - a decade's worth of their orchestral recordings, the first in Spitfire's new eDNA series, Earth, comprises a whopping 45GB (losslessly compressed down to 27GB) of samples. "Samples cover a staggering amount of ground, from dirty and aggressive to epic and cinematic via analogue, chiptune, funky and more"
The scripted Kontakt engine is impressive, if a little fiddly in places. A patch is made up of two layers, each taken from a library of over 1900 sounds, which can be mixed manually or via a dedicated LFO, and gated via a pair of step sequencers. Then there are high- and low-pass filters, LFOs for volume, pitch and filter cutoff, amp envelopes, and an insane effects section complete with a convenient Dashboard to which individual parameters from all modules can be added. The library is just immense. As well as the 1900+ "factory" sounds, you also get 1001 "artist" presets, covering a staggering amount of electronic- and dance-orientated ground, from dirty and aggressive to epic and cinematic via analogue, chiptune, funky and more.